Gummi candies are all the rage in Japan right now. The summer heat has not yet dissipated, so to eat chocolate or anything temperature-sensitive is difficult. Gummi candies are the perfect solution when you need your sugar fix and the temperatures aren’t cooperating. 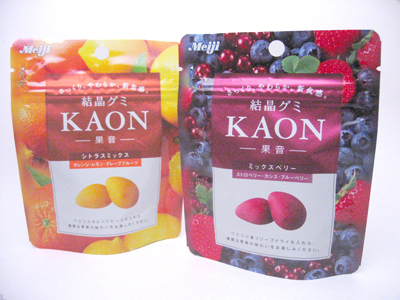 JBox.com was kind enough to send me samples of Meiji’s Kaon, a currently popular gummi candy. The real lure of Kaon (the “ka” stands for fruit) is that there are real bits of fruit in there for a real fruity taste, which I definitely picked up on when I tried these. The Berry Mix has the flavors of strawberry, blueberry and cassis and the Citrus Mix has tangerine, orange, lemon, grapefruit, and mango. Yum! The design of the bag is also beautiful and very eye-catching (something I think is very important!) not to mention useful; it has a resealable top so you can put half away to eat later. 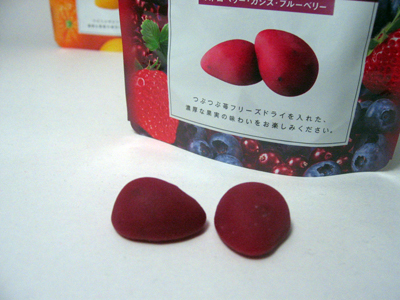 Berry Mix: They look like tear drops and are a very opaque wine color. Slightly squishy but not bouncy when handled. The texture is more like a “fruit snack” than a gummi, which I found a nice surprise. They feel dense and starchy and not very rubbery at all. The flavor tastes of black currant with a tart berry aftertaste, which is very long and complex. I get zestyness and tartness of blueberries and a hint of sweet strawberry. Impressive to sat the least. It reminds me of a good, fresh berry juice. The flavor is very powerful and gets the juices in your mouth flowing. I really liked these, and was sad that they seemed to disappear so quickly. Citrus Mix: Again, they are little tear shaped opaque candies and because of the color they look like baby mangoes! They smell really strongly of grapefruit, which I find most pleasing. The texture is the same as the berry variant; dense and a little grainy with the fruit snack essence. As for the flavor, it is so fresh and zesty! It tastes first of grapefruit and then transforms to lemon giving your mouth a wonderful clean feeling. Not too tart, but just enough to get the saliva going. These are quite impressive and I would gladly buy them again. I wish there was something like this available in the US! I did order the Citrus Mix from JBox, I’m really looking forward to them (and the Pine Fresh Mentos).